The Bishop of Waterford & Lismore has said he has received up to nine requests over the past couple of years from people who believe they have encountered evil spirits. Bishop Phonsie Cullinan said he absolutely agreed with Pope Francis that “the Devil is not just a symbol for bad things, he is a personal force of destruction, wanting to bring down humanity”. In an interview with WLRFM’s Déise programme, Dr Cullinan warned people off Reiki, a form of hands-on healing that invokes a universal energy. He revealed that he is in the process of setting up a group of people in his diocese who want to be part of deliverance ministry. 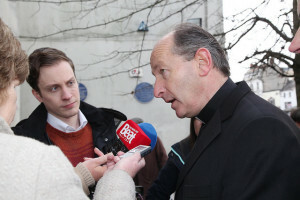 On deliverance and exorcisms, he told the WLRFM programme, “You have got to pray and with the permission of the bishops recite the prayers of exorcism. It is a tricky area – it must never be done on one’s own and there always has to be prayer behind it. The Bishop said he had felt the presence of Satan himself though he has never seen an exorcism. He also revealed that a priest in the diocese of Waterford & Lismore is undergoing training as an exorcist. But Fr Collins suspects that some priests have been authorised to handle exorcism cases on an ad hoc basis. It also means that if a priest is consulted by a person who claims to be spiritually oppressed or possessed, many priests tend to feel ill-equipped to help them. “Nearly every day of the year I receive an email or phone call from desperate people who feel oppressed by evil spirits or who believe that their home or workplace is haunted in one way or another,” Fr Collins explained. In his letter to the Irish hierarchy, he called on dioceses to form exorcism teams that include a trained priest (canon 1172), a sympathetic psychologist/psychiatrist, and some experienced lay people. “Bishops also need to draw up ethical guidelines and protocols to be observed when priests and/or lay people engage in deliverance prayer or exorcism,” he said. Meanwhile, figures released earlier in the year show the number of exorcisms in Italy tripled recently, with experts predicting that around 500,000 requests are made a year. These figures emerged at a conference for exorcists taking place in Sicily in February, which also discussed the need for more priests, and better training, for those tasked with liberating people from demonic possession. “All the people who come to us suffer, but they are many and we are few,” Fr Paolo Carlin, a Capuchin Friar and spokesman for the International Association for Exorcists told Italian newspaper Corriere della Sera. The exorcists’ event in Palermo in February took place a couple of months before a similar gathering from 16 to 21 April in Rome at the Pontifical Athenaeum Regina Apostolorum Institute. Among the speakers at that event were Fr Cesare Truqui, a student of Fr Gabriel Amorth, the world’s best known exorcist. Fr Amorth, who died in 2016 at the age of 91 after spending many years as the Diocese of Rome’s exorcist, claimed those possessed by demons would vomit shards of glass and pieces of iron, and even argued the devil had got into the Vatican. While there are no officially collected figures of exorcisms, one priest said the numbers are growing in part because the numbers of people ready to go to magicians or tarot card readers have grown. Fr Benigno Palilla, a Franciscan friar and prominent exorcist in Italy, added that “doing so opens the door to demons and to possession”. He argued that more training was needed for priests in this area, saying that many clergy were ill-equipped to deal with those in the grip of evil spirits, and that formation should take place in seminaries. The exorcists’ international association has 400 members, of which 240 are in Italy. Fr Carlin pointed out that there were a number of ways to recognise someone possessed by an evil spirit. These include: a “furious aversion” to the sacred or sacred objects; signs of abnormal physical strength; a knowledge of languages such as Aramaic and Latin previously not known and a deep knowledge of the occult.